"No limits. No fears. No substitutes." Goldeneye was what began the eventual turnaround of James Bond from a campy parody of secret agent film to a more legitimate series of thrillers about international espionage. This movie starred Pierce Brosnan as 007, a role he would reprise in latter films, and it also debuted Judi Dench as the head of MI6, M. She would remain in that role until the film Skyfall, released in 2012. Goldeneye begins with the theft of a Cold War super weapon, a satellite control system developed by Russia when it was still a Soviet power. This system, code-named Goldeneye, is a satellite that has the power to deliver a devastating electro-magnetic pulse, capable of destroying the defensive capability of any electronic system in the world. Bond is dispatched to make sure the weapon doesn't fall into the wrong hands, and to safeguard queen and country against Goldeneye being used by terrorists or others making a grab for power. The film treks across Europe, Russia and finally to South America where the final steps of the Goldeneye setups are taking place. Bond, paired with one of the programmers who worked on and managed the Goldeneye system, peels away one layer of deceit after another until the true power behind the play comes into the light. To that end (spoiler alert) one of Bond's friends, 006 who was presumed dead, turns out to be the face behind the name Janus, the man who engineered this entire plot. James has to use brains, brawn and every gadget that Q provides him in order to fight against a former 00 agent, along with his private army of thugs and his own, rogue programmer who tries desperately to bring Goldeneye online for his employer's dastardly purposes. In the end Bond saves the day, gets the girl and lives to fight another day against whatever threats may loom to threaten the world, and England, tomorrow. 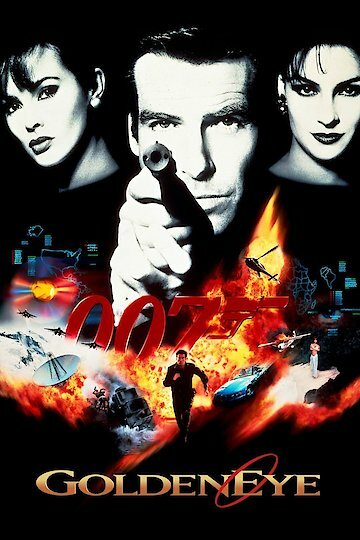 A solid Bond film, with enough action, drama and love scenes for any fan of the series. GoldenEye is currently available to watch and stream, download, buy on demand at Netflix, Amazon, Vudu, Google Play, FandangoNow, iTunes, YouTube VOD online. James Bond playing James Bond on the N64. Crazy.